Last admittance half an hour before closing time. 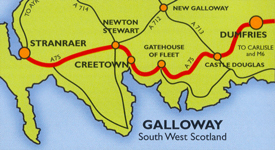 Creetown is in Galloway in the South Of Scotland. The Gem Rock Museum is very easy to find. Located in Creetown we are 7 miles from Newton Stewart and 11 miles from Gatehouse of Fleet on the A75 Carlisle to Stranraer trunk road directly off the M6 Motorway. Just follow the signs on entering Creetown village.